It’s always good to see new British/Commonwealth figures to add to those already available. These 2 new crew figures from Resicast will, I believe, be welcomed by Allied modellers as they provide the first new crew for the Universal Carrier since the Tamiya kit came on the market. Although marketed as RA crew for the new T16 carrier, these two figures should fit well into any of the currently available 1/35 carriers. In a new development both crew members are accompanied by additional stowage for the T16, but again this could most likely be adapted for other variants. The set comes in a sturdy Resicast card board box, on the front is a picture of the crew and stowage deployed on the vehicle and there are also 3 small additional pictures on the side.Inside the box are 3 small zip plastic bags containing the 2 figures, a set of the adjustable suspensions units, for that weighted down effect and a slightly larger zip bag containing the additional stowage items. All the items were wrapped in additional bubble wrap for extra protection and the contents arrived undamaged. There was no parts list in the box which is unusual for Resicast, although not unusual for their figure range. The set is cast in the typical Resicast light cream resin. Pictures provided on the box top/side should provide sufficient guidance for placement of the parts and for painting you should consult your references. Both figures have been designed for the rear compartments of the T 16 carrier. The 1st figure I’ll look at is the crewman for the right hand side compartment. The main body is in a seated position with the legs facing front with a slight bend at the knee. This figure has been designed to sit on top of some of the additional stowage, his right arm (a separate item) resting on the carrier rail and his left arm (moulded as part of the body) bent at the elbow with the hand resting on his knee. He is dressed in 39/40 Battle Dress complete with pleated breast pockets and with the collar fastened. He is wearing; 37 pattern basic web equipment consisting of belt, shoulder straps and ammo pouches with anklets and ammo boots. The head supplied is wearing the Mk III helmet with netting on top and chin strap. His facial expression is hard to pin down, he could be at the beginning of a smile or concentrating on what he is about to say. All the items of this figure were well cast with minimal clean up required other than removal of the small pour plugs. He should sit naturally within the carrier and produce a very convincing crewman. The 2nd figure is designed for the LHS rear compartment. Again the main body is in a seated position with the left leg bent up and the right pointing forward in a straighter position. He is dressed as per figure one and again only a small amount of clean up would be required. Both his left hand and right arm come as separate items. In this packet there was a choice of 2 heads. The first shows a face masked with a bandana and wearing goggles. On top of the head is a Mk III helmet with netting. This head needs a little clean up under the neck. The second head is of a soldier again wearing a Mk III helmet, with the chin strap across the front and netting on top. This time the helmet is tilted back on his head exposing his face. He is clearly smiling with a happy/pleased look on his face. Both faces appear to be of quite young soldiers, one slightly older looking than the other. Both figures were well cast with good sharp detail, the only clean up being the removal of the plugs and perhaps a little work behind the LHS ammo pouch on figure 2. They should provide a useful and interesting crew for the back of any carrier, or for that matter probably the back/side of other vehicles too. The crewmen are designed with interaction in mind and the positions look quite natural and relaxed when seen in the vehicle. With a little bit of thought alternative seating positions should be achievable if desired. The suspension unit has been reviewed before. Suffice to say this is a very useful additional item for the weighted down effect so often seen on these vehicles. In the larger zip bag were the additional stowage parts, comprising of a bulk item for the rear of the carrier. This is made up of ammo boxes, what appears to be ranging poles/stakes, blankets, a spare wheel for the 6pdr with camouflage netting protruding. On the top is an open compo box with items displayed, plus a 6pdr ammo box. In addition are 2 items of stowage for the left and right rear compartments which form the ‘seats’ on which the figures rest. One consists of 2 x 6pdr ammo boxes with blankets on top and the other is a blanket/tarp affair. The remaining 2 items are a separate 6pdr ammo box and a roll of barbed wire which looks quite convincing. Also on the back of the bulk stowage is what appears to be a blank sign post. All the items I looked at were well cast with good detail. Ropes are cast over the rear stowage on most of the items but you may need to add a little rope over the ranging poles/stakes and 6pdr ammo box. Two very useful figures, that although designed for the T16 Carrier, finally provide some alternative crewmen for the other variants of this vehicle. A very welcome addition to the British/Commonwealth range of figures. The items are crisp and clear with only a minimal amount of clean up required and the concept of the crew plus additional stowage items is a pleasant and welcome surprise, perhaps a sign of more things to come!!! They make a welcome addition to replace the Tamiya crew if desired, adding more variety and options. I can see this set being useful to both those who build the T16 and to other carrier builders in general. A Build Log has been started on the forums using this set. While incorporating this set into a build it has become apparent that the figures legs are extremely short. While they fit well on the included stowage, which may have been sized for the figures, this flaw is noticeable using them with other figures/items/vehicles. The rating score has been adjusted due to this. Highs: Welcomed subject matter. 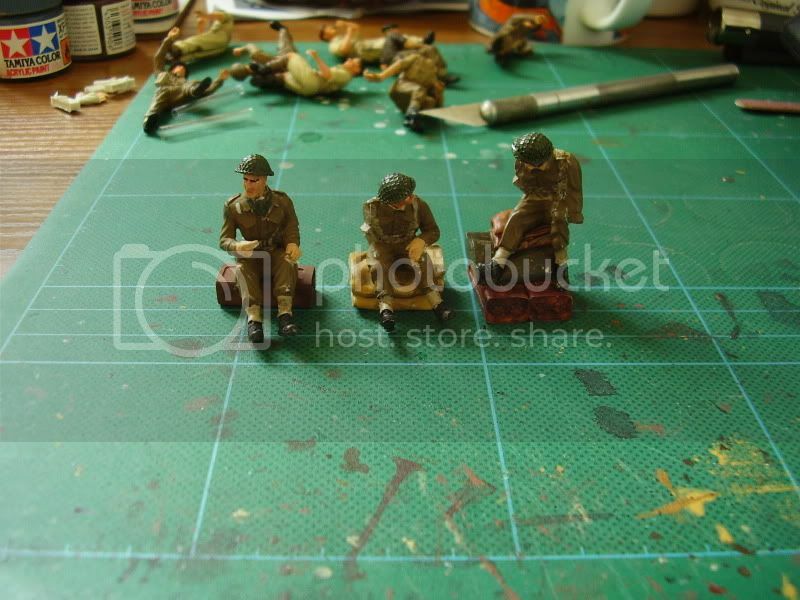 These 2 figures along with the additional stowage items will be of use to many modellers of allied vehicles. Excellent quality casting, good clear detail, user friendly and a very welcome set indeed. Lows: I couldn’t think of any, other than open collars would have been good on one or both of the figures. EDIT...Figures legs are extremely short. Verdict: These figures and the additional items should build up easily and paint up into high quality ‘loads’ for your carrier, whether it be the T 16 or one of the many variants possible. Recommended. Good in depth review Alan. I picked up this set at Euro and really like the figures. The alternate head is a great idea. I also like the moulded on rope on the rear stowage. Found this on the IWM site while looking for something else- they're in a Loyd Carrier but a good pic: Guardsmen of 3rd Irish Guards in a Loyd carrier, wrapped up against the clouds of dust, during Operation 'Goodwood', 18 July 1944. Are they wearing overalls or is the pic reversed?